Tópico: Happy 6th Server Anniversary! 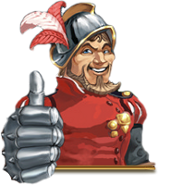 Today, the Brazilian version of The Settlers Online celebrates its sixth anniversary. We are thankful for all the players who remained faithful throughout these years and we are hoping that you will continue to play the game for another fun year. As we celebrate Prospervila's birthday, we are going to give away gems to several very lucky players. 100 gems to anyone who can correctly guess the total number of posts in this thread by the end of day January 23rd (including this announcement). If nobody gets the correct total number of posts, the closest answer(s) get the prize. To participate, simply post your best guess in this thread. Players can post multiple times. However, only the last guess per player will be considered. Players are not allowed to edit their answers. Put on your pyramid hat or consult that mystic ball and take your best guess! NOTE: Posts will be hidden until the end of the event. Winners will be announced tomorrow, January 24th. The day ended with this thread receiving five posts in total. Vernillion with the closest estimate will be receiving 100 gems in the mail. Thanks to everyone for participating! Todos horários são GMT +3. Hora atual: 23:48.